For those who know my story, I didn’t start out as a New Covenant teacher. For many years, I was stuck in the bond of religion, in a spiritually-toxic church, living with physical pain in my body from all the guilt, shame and condemnation I was living in. Even when I was dying inside from all the messed up doctrines, I was still out doing evangelism and seeing miracles on the streets. This brings me to a point that needs to be emphasized. Signs, wonders and miracles, are not any indication that your doctrine is correct, or that you are somehow on some other level above other believers. In fact, signs, wonders and miracles, Paul described as milk that the Corinthian church was obsessing over. Even Judas Iscariot was sent out to perform miracles (Matthew 10:5-8). While I fully support the supernatural lifestyle, the issue I’ve come in contact with is that people think this is the pinnacle of Christianity, and if you are not doing these signs, wonders and miracles then somehow you are less of a believer. And many artificial lines are being drawn between brothers and sisters, very much as what was happening in the Corinthian church over who can manifest what. As my good friend Dr. Eric Wilding has phrased it, there are two questions that every person is wrestling with; Who am I? And Who is God? Much of the Identity teaching out there is very much focused on the first question of, “Who am I?” And it’s exciting to learn about our identity in Christ, and learn to function in Prophecy and Healing, but all the discipleship in the world will never answer the second question. To return to my story, even though I had all the external manifestations happening in my life, it wasn’t until I awakened the New Covenant that the issues of my life started to resolve. It was by understanding the basis of my relationship with the Father and his character, that finally brought peace and allowed me to truly grow as a whole person. In that freedom, I was confident enough to start to seek out the answers to the second question, Who is God? Ultimately, I believe that any good Ministry School needs both questions answered for a believer to truly grow as a whole person. The problem is that to answer the second questions, requires that you discuss topics that most believers would rather not have to deal with. To answer the question of Who is God? A person will needs to address subjects about the nature of the atonement, Hell, Judgment, and confusion about End Times. Unfortunately for most ministry schools, it’s just easier not to deal with those issues. When I’m a part of conferences, I am always encouraged when a person brings up the Issue of Hell, End Times or some other controversial topic. The fact that these are divisive subjects tells me two things; firstly, that we have created an environment safe enough where that person feels comfortable enough to ask the hard questions, and secondly, it shows that they have looked beyond their own identity and started to seek after the Identity of God. For instance, on the subject of end times, if Christians really believe that at any moment Jesus Christ is going to Rapture the Church and bring an end to the world, many believers would just rock back and think well, whats the point of doing anything, it’s all going end just now. An unhealthy end times view will lead to apathy, and cause many people to make choices about their lives that can be harmful to them later in life, because they think they aren’t going to be around that long. Worse yet, an unhealthy end times teaching can leave many believers open to different forms of abuse! Slick End Time Prophets have convinces many young people to give up their education for the sake of ministry. Because of these fear-based teaching, some adults sell their homes and spend their life’s saving trying to “save the lost at the last second,” only to end up in financial ruin when the end times date doesn’t happen. Another subject in need of exploration is that of the Atonement. The narrative of the Penal Substitution view of the atonement has caused many believers to walk away from the faith. The contemporary concept that Jesus took all our wrath, in order for God to forgive us, is seen by many for what it really is, Child Abuse. No believer, if they hold to the idea that God is Love, will be able to reconcile the idea that it takes human sacrifice in order for God to solve our problems. It is a legitimate issue that needs to be resolved in the minds of believers. But to resolve it, it requires exploring alternative views of the atonement such as Christus Victor and the other Redemptive messages. Without dealing with this issue, many Christians are left with a false dichotomy, that creates a two-faced God in their mind, that both loves them and hates them. And no believer can be made whole, living with that image of God. While there are a multitude of other topics that usually come up in these studies, they are necessary to protect believers from this type of abuse and mental gymnastics. Believers need to know who God is, and in doing so, we learn who God is not. While many ministry schools seek to disciple believers, not many are willing to venture into these topics. They prefer to remain in the safe havens of healing and prophecy, to which I have no objections. Where I do have a problem is when these ministries then go on to demonize and criticize people who have gone on to answer these questions, while offering no answers themselves. Unfortunately, that has been my experience all too often. 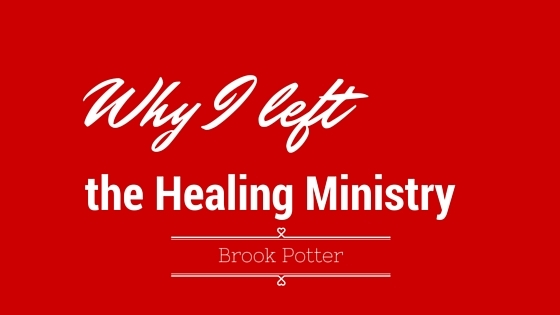 I left the healing ministry because I wanted to know who God was. To do so, I could not play in the baby pool and just be satisfied with more healing and more accurate prophecies any longer. After doing healing and prophecy ministry, and still suffering internally from all the guilt shame and condemnation, it was evident to me that identity alone could never solve the issues in my heart. I still go out and heal the sick and I have many articles and teachings on the subject of Healing, but the passion of life is who God is, and sharing what I learn with others. Seeking the answer to who God is, will consume me for the rest of my life, as it was meant too. Through that journey I have seen greater peace in my life, and healing in my relationship with God. I am now free to be the most free and honest expression of myself, without the pressures of ministry performance. My life has becomes about just living and enjoying God, while ministry has becomes a natural by-product of that life. While that may not be for everyone, it is what I believe works for me. Eric Wilding talking about our Union with God. Hey Brook – that was powerful brother! Thank you & keep doing what your doing. You are amazing & I appreciate you brother! Great post Brook – Learning who we are is not found in what we can do or perform! Does this mean that you still heal the sick, raise the dead, and cast out demons, or you gave it up for something else? I’ve been searching for someone in the healing and deliverance ministries, that ALSO believes, at least, in the possibility of Universal Reconciliation.